for reactivating the rail line. On Saturday, September 29, at 1 p.m., the WRBA hosted a special forum dedicated exclusively to the question of what to do with the inactive railroad tracks of the former Rockaway Branch line, which run along 98th Street in Woodhaven. The meeting featured presentations by a speaker supporting each of the two leading proposals: returning the tracks to use for an active train line, or converting the route into a walkway and bike path dubbed The QueensWay. The presentations were followed by a session where the speakers took questions and heard the opinions of the residents in attendance. The meeting was held at the Queens Tabernacle on 96th Street. The WRBA wishes to thank Pastor Dan Bowman for opening the doors of the Queens Tabernacle to us. After a coin flip to determine who would present first, Mr. John Rozankowski took the microphone to make the case for reactivating the rail line from the Rockaways, through Woodhaven, and into Rego Park. Click here to view the handout Mr. Rozankowski prepared for the meeting. Here is a map of the proposed railroad reactivation. In Woodhaven, this route would cross Atlantic Avenue, pass through the neighborhood, cross Jamaica Avenue and Park Lane South, and proceed behind the Forest Park Co-ops and Victory Field. Here is a video of Rozankowski's presentation in favor of reactivating the rail line. Andrea Crawford delivers a presentation for The QueensWay. Next was the presentation by Andrea Crawford and Travis Terry, advocating on behalf of The QueensWay. The project would convert the tracks into green space for walking and bicycling, similar to the very successful High Line in Manhattan, which itself was converted from an elevated freight line in 2009. The High Line project has revitalized the areas it passes through and supporters are hopeful that it could do the same in South Queens. Click here to view the slide show that Crawford and Terry used during their presentation. And here is a video of Crawford's presentation in favor of The QueensWay. After the presentations, we opened the floor to questions and comments from the audience. By the time we reached this part of the meeting, the room was at capacity and some attendees were standing in the hallway. 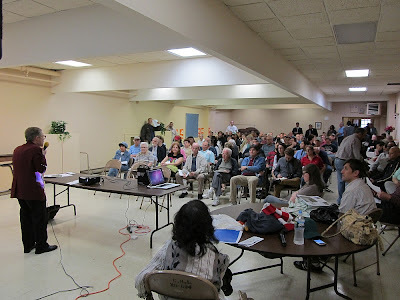 We estimate that over 150 Woodhaven residents were in attendance. Here is a video of the part of the meeting when residents voiced their questions, comments, and concerns. 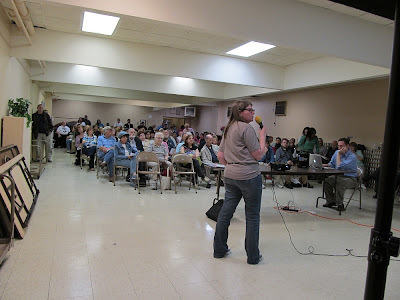 The meeting was spirited at times, and residents raised a wide variety of points and questions. Though we did our best to hear from as many residents as possible, it was not possible in the two hours allotted to the forum, so we urged residents to contact us after the meeting to share their thoughts. This meeting played a key role in helping the WRBA formulate its position on this important issue. To find out more about the WRBA's stance, please see this page in the Issues section of our website.